“Skrypuch continues her collaboration with the Ho family in telling the stories of their escape from Vietnam after the war. Here the youngest daughter, Van Ho, pieces together memories of being the one who was left behind at the age of four…. “Skrypuch and the now-adult Van Ho collaborate on this account of Van’s life from the morning she woke to find her mother and siblings gone to when, four years later, she was reunited with her family in Toronto…. Click here to see the full list of recommendations. CanLit for LittleCanadians says "[this] is a story of survival, even if Van Ho was Too Young to Escape "
“When Marsha Forchuk Skrypuch co-wrote Adrift at Sea: A Vietnamese Boy’s Story of Survival with Tuan Ho, she began a family’s story of escape from Vietnam in the aftermath of the Vietnam War and taking of power by the communists. In that picture book, illustrated by Brian Deines, a mother and her two daughters, Loan and Lan, and six-year-old son Tuan escape Vietnam by boat, hopeful of joining father and the eldest daughter Linh in Canada. But there was another story. Because four-year-old Van is left behind. Too Young to Escape is her story…. Van Ho, who lived this story, tells it through Marsha Forchuk Skrypuch’s pen of extraordinary writing which reflects both Van’s youthful point of view and her trauma. Her story is disquieting but it’s also uplifting, focusing on Van’s resilience. Told from her perspective, from Van explaining away her family’s absence before she learns the reason to her obligation to completing chores many of our culture might deem inappropriate for one so young to finding a friend in a girl less fortunate than herself, Van’s story of being left behind is heartbreaking. CM Magazine calls Too Young to Escape "a page-turner"
“Rating: 5…Van’s story is necessarily informed by Skrypuch’s research and imagination in addition to Van’s memories of her distant childhood as corroborated by other members of her family. The product, is an extremely engaging account of a childhood in challenging circumstances…. Van’s story is a page-turner. Children will relate to her sense of injustice…. Too Young to Escape is a welcome reminder of the post-Vietnam War refugee crisis that saw Canada, France, the United States and Australia welcome strangers in need. Readers will appreciate hearing this personal story from a child’s perspective. The book will include an eight page colour insert of photographs of Van and her family as children plus a recent photo of Vanessa (formerly Van) with her spouse and children and a final image of Vanessa and her beloved Bà Ngoąi taken in 1997. Skrypuch includes very brief interviews with Van’s parents, Nam Ho and Phuoc Ho, that help to explain the context of the time including the reasons for their difficult decisions. Readers may have wondered why the telephone or e-mail was not used by Van’s parents. The paucity of telephones in Vietnam in the early 1980s and censorship of physical mail by government officials are two more challenges that Van’s parents note in their interviews. Modern technology may make it easier to communicate over long distances today, but civil wars, state-sanctioned or state-sponsored discrimination and persecution are enduring reasons for normal people to be transformed into refugees in the twenty-first century. Van’s story and those of her family members remain timeless as well as time-specific. 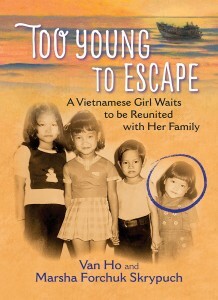 Kirkus Reviews calls Too Young to Escape: A Vietnamese Girl Waits to be Reunited with Her Family "a truthful yet age-appropriate introduction to big issues"
The first-person narrative should hold readers riveted….The importance of family shines through this compelling memoir, and a series of color photographs adds to the emotional impact. 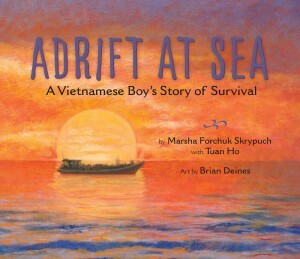 “This stunning book tells the story of Tuan Ho, who at age 6 was forced to flee Vietnam with his mother and sisters…. His flight would be traumatic: terror, grief, gunfire, strangers, and perilous days adrift at sea. This taut account conveys exceptionally well just what refugee children endure, enlarging our compassion and will to be among those who welcome, comfort, and receive them today.